Having made his mark on both America's Got Talent and America's Got Talent: Champions, Piff The Magic Dragon has become one of the hottest acts in Las Vegas, with a residency at the Flamingo Casino at the newly renamed Piff The Magic Dragon Theatre. The run has recently been extended due to popular demand. That hasn't slowed the dragon down. Boasting a show that is "50 percent magic, 50 percent comedy and 100 percent dragon," Piff is now embarking on a tour of the U.S. and Canada, dubbed The Lucky Dragon. 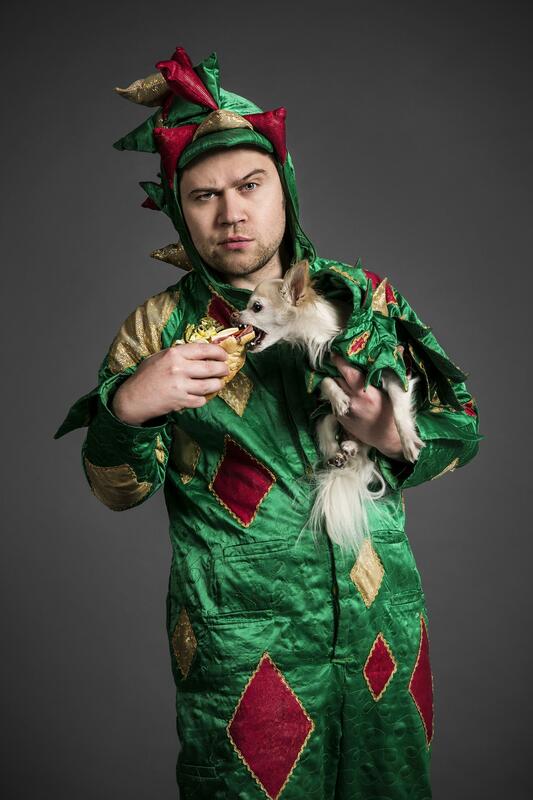 Piff The Magic Dragon performs at Wichita's Orpheum Theatre Saturday, Feb. 2. How do you approach a new tour? Do you feel the need to reinvent the whole show or is it a combination of things that you've done over time? We're on tour all year round. By the time the year starts again, we've got enough new material for a new show. We change the name and start again. When we go back to a city, because we haven't been there for a year-and-a-half or two years, the show ends up being new. I'm curious how a dragon winds up in Las Vegas with a long-term residency and has such a successful run there because that's not the easiest thing to tap into. How did that happen for you? I had to leave England, first of all, because that country is full of dragon-hating people. Their patron saint is Saint George, the notorious dragon slayer, and every year on April 23 they have St. George's Day where they celebrate the slaying of an innocent dragon. Las Vegas is a desert, which is perfect for a cold-blooded reptile like myself. I've got a little two-bedroom cave in the mountains here, and it's a lot more friendly for my species. I've had my show at The Flamingo three-and-a-half years now. When we went out on the road, we were selling out from day one. With Vegas, it took a few more months to establish but now … we just broke all the records at the box office over Christmas again and last year we had our biggest year ever. It seems to have taken root in Las Vegas, which is very good. As you were developing this show, you must have encountered people who said, "I just don't get this." But you stuck with it. It wasn't very difficult for me because, in my mind, I knew what I wanted to do with it and how funny it would be. I think it was much more difficult for other people because they were, like, "This isn't funny yet." It took a while for it to get to where I imagined it to be. That was more difficult for other people. I knew where it was going. You've also recently done a one-hour special. Do you know what platform it will be on? Whoever pays the most money! We're still finishing it. It's got a couple of bits left to finish. Hopefully this year. Penn Jillette is part of this. That's a good get. They gave me my first break, Penn and Teller. I did a show with them called Penn & Teller: Fool Us in 2011. It went viral on YouTube and got millions and millions of hits back in the day when that was kind of unusual. They also wrote to me and said, "We loved what you did on the show and if we can help out in any way, let us know." So we became friends ever since. They've been mentors and heroes to me over the years. You've also been on America's Got Talent and America's Got Talent: Champions. What has that experience been like for you? We've had a great time. Before that show I was out in Las Vegas, trying for a year to get the show off the ground and couldn't get anywhere. It was by going on America's Got Talent that I was able to get exposure to have people know who I was. Enough to get my own show. Jedd Beaudoin is the host of Strange Currency. Follow him on Twitter @JeddBeaudoin.To contact KMUW News or to send in a news tip, reach us at news@kmuw.org.